With a presidential recall ballot less than two weeks away, many Venezuelans arenât so sure. âIf they recall Chavez, theyâll fight among themselves for power,â said Alejandro Diaz, a security guard standing outside a restaurant in downtown Caracas. Polls suggest the Aug. 15 referendum will be close. Venezuela, an impoverished country that sits on the largest oil reserves outside the Middle East, is sharply divided over Chavez. Supporters applaud his efforts to improve life for the poor majority while opponents accuse him of becoming increasingly authoritarian. Two previous efforts by the opposition to oust him backfired. A botched 2002 coup cost the opposition the trust of many while a two-month general strike last year ruined the economy but left Chavez stronger than ever. The recall ballot is the oppositionâs one success. The opposition gathered 2.5 million signatures in a petition drive to force the recall. 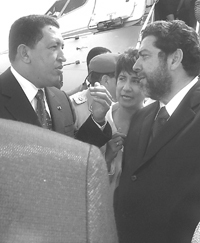 Opponents now need more than the nearly 3.8 million votes Chavez won in a 2000 re-election to force new presidential elections. Some analysts say the opposition can only offer Venezuelans an alternative if it makes a clean break with the corrupt two-party political system that crumbled with Chavezâs 1998 election. That system rewarded loyalists and shortchanged the poor, who account for about 80 percent of the countryâs 24 million people. âItâs not enough to come together to oppose Chavez. They must go through a process of change, make it credible and show they are not returning to old politics,â said Michael Shifter, a Latin America analyst at the Washington-based Inter-American Dialogue think tank. âAre these different sectors stuck in the past or has there been a process of renovation and self-criticism? The signs have not been encouraging so far,â Shifter added. Opposition plans that outline future government policy and call for a primary to pick a single candidate are steps in the right direction, said Steve Johnson, an analyst at the Heritage Foundation in Washington. âAgreeing on the rules of the game is important because even if there are policy differences between leftists and right-wingers, populists and nationalists, they can re-establish how Venezuela should be governed. I think thatâs a positive step,â Johnson said. A platform proposed by the Democratic Coordinator coalition of opposition parties is careful not to attack Chavez programs to benefit the poor – saying those that work will continue. The coalition proposes repairing relations with Washington, which have suffered under the leftist Chavez, and restructuring the state oil company that was torn down and rebuilt to the presidentâs liking. It also calls for a more traditional role for Venezuelaâs armed forces, which have been used to promote Chavezâs social programs. Chavez, meanwhile, is touting the benefits of his social programs. They include efforts to increase literacy, improve medical care, strengthen the countryâs infrastructure, and bring the Internet to remote areas. Chavez has suggested that if he loses the recall, he can run again in elections that would be held within 30 days. Venezuelaâs courts havenât ruled on the issue. Even then, some have their sights set on the next scheduled presidential elections in 2006. Chavez vows to serve at least two more terms, or until 2021.
âEven if the opposition wins after the referendum, if the recall is successful, there is only a year and half to get things on track so that they can weather another onslaught by a nationalistic candidate,â Johnson said.